On October 4th, 1957, Sputnik was launched, and the Space Race commenced. This was a technological and ideological battle between the USA and the USSR at the height of the Cold War, and Public Service Broadcasting have skilfully utilised archive recordings produced in the parallel media battle between these competing nations in their second album, The Race for Space. This develops the approach used so effectively on the diverse album Inform, Educate, Entertain (2013) and the more thematic E.P. The War Room (2012). The Race for Space is one of those rare beasts in mainstream music, a ‘concept album’. It is interesting to note that recently Public Service Broadcasting’s main songwriter, J Willgoose, felt the need to state almost apologetically in a guest column for ‘Q’ magazine ‘How I learned to stop worrying and love concept albums’. There really is no need to apologise as the synthesis of contemporary archive sound clips and an imaginative range of modern electronic musical settings excellently portrays this epic story of human endeavour. The opening title track uses an ethereal choir, backing the famous speech in 1962 by President Kennedy in which he committed the Americans to landing a man on the moon by the end of the decade. The voices build as the power of Kennedy’s oration grows, and what could have been a cold, technological album is introduced with a human element which was at the heart of the Space Race. Sputnik takes us back to the start of the story using the rhythm of the satellite’s signal to drive the song along as a voice intones: You will now hear the voice of the Russian Moon. It becomes apparent early on in this album that the use of sound clips is interweaved skillfully with the music to enhance the story, and is not used in quite the same gimmicky but albeit entertaining manner of their first album. This pulsating and powerfully building track manages to convey the advent of a new technological age in which the Soviets took great pride in great contrast to the menace the Americans would have felt about the launching of an object into space above them at the height of the Cold War. The rival perspectives in the Space Race are cleverly conveyed well by the excellent dual cover by Graham Pilling which has the Apollo Landing by the Americans on one side or the flight of Sputnik by the Soviets on the other side – one can choose what should be the cover shown! Reflecting the early lead the Soviets took in the Space Race the following track also has a Russian theme, celebrating the achievement of the first main in space, Gagarin. Any fears that this album may be dominated by dry, technical electronic ‘spacey’ music are blown away by what J Willgoose describes in the extensive and interesting sleeve notes as a pseudo-funk superhero theme. This song is also a fine showcase for the sinuous and powerful drumming of Wrigglesworth, who underpins and punctuates the whole album along with a range of percussive skills. In complete contrast the dangers of space exploration are mournfully explored in Fire in the Cockpit, tragically describing the devastating fire in the capsule of Apollo 1 in 1967 which killed three astronauts, whilst they were on the Launchpad. 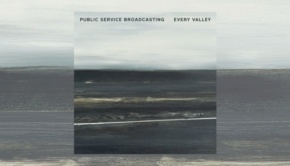 Public Service Broadcasting emotively use the melancholic tones of strings, particularly Leah Evans and Clementine Vale’s cellos, over the stark sounds of static and the emotionless voice of a NASA official explaining the circumstances of this tragedy. It is almost too sad to listen to, and J. Willgoose admits he thought long and hard about whether he should write a song about such a tragic event, but concluded that the story of their sacrifice needed to be told. E.V.A. (Extra Vehicular Activity) perhaps appropriately is a much more lightweight track about Alexei Leonov, the first man to walk in space in 1965, which is more in the style of their previous album but is a less engaging song. The Other Side is a more interesting and dramatic piece about the Apollo 8’s historic orbit around the Dark Side of the Moon in 1968, in which the astronauts witnessed the famous image of the Earth rising above the horizon of the Moon. Avoiding the oft-heard sound clips of the astronauts, as used by Mike Oldfield amongst others previously, Public Service Broadcasting choose to filter their perspective through the business-like tones of NASA Ground Control. There is a different drum sound to the previous Soviet based songs as the band used different drum kits and set ups for the different superpowers. The slowly growing song drops to a tense quiet as ground control nervously await for Apollo 8 to re-appear from its journey round the Moon. The song opens out in celebration to reflect the barely concealed joy in the voice of the ground controller as he announces their successful orbit, and then shimmers to a close. 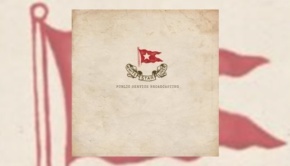 The last Soviet based song on the album shows Public Service Broadcasting going in a different direction as they collaborate for the first time with other artists, the Smoke Fairies on Valentina, and use virtually no sound clips. One drawback about the vast majority of historic archive film and sound clips J. Willgoose has noted is that they are dominated by the male voice, even the story of Valentina Tereshkova, the first woman to go into space in 1963. Therefore, he chose to work with female vocalists, whom co-wrote the song, and their delicate female voices float across a gentle largely acoustic song to convey the loss of gravity and her heroic achievement aboard Vostok 6. The crowning achievement of the Space Race, needless to say, was the first landing of man on the Moon in Apollo 11 in 1969. Go! tells that story yet again largely from the restrained professional voices of the Ground Control staff. Their systematic responses to checks on whether to proceed with landing give the song a rather hypnotic rhythm, and pays tribute to the myriad back-up staff that enabled Armstrong and Aldrin to make their historic landing. 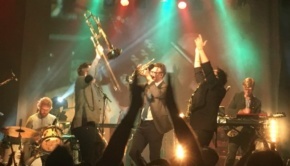 The song builds in intensity as the moment of landing approaches with guitars chiming over the keyboards, and Wrigglesworth’s sparkling percussion driving the song towards touchdown. It is strange to relate now that within 3.5 years of that magnificent and historic event the manned space programme to the Moon ceased as the U.S. public perversely very quickly lost interest, and both superpowers started to balk at the enormous costs in such exploration. 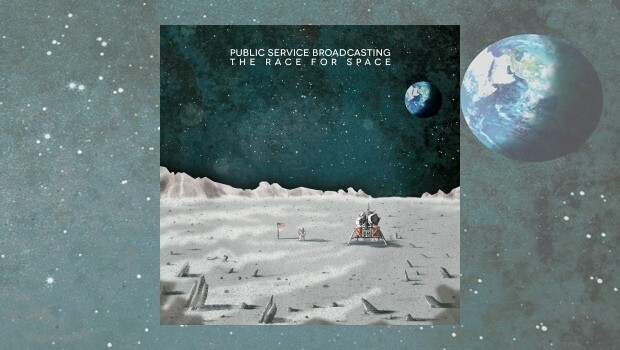 The Space Race effectively ended with Apollo 17’s last mission to the Moon in 1972 so Public Service Broadcasting close the album with Tomorrow as the last astronaut on the Moon states the …challenge of Today has forged Man’s destiny of Tomorrow. 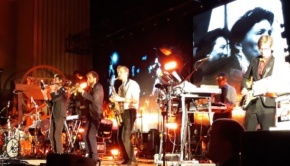 After a short silence the track and album ends with what J.Willgoose describes as a ‘call of the moon’ type instrumental to suggest that there is unfinished business Man’s exploration of Space. ‘what we attempted to do was recapture the spirit of awe, excitement, amazement and danger that prevailed at the time, to link it together with some recurring musical themes, to bring it into the present and reframe it for our own times’. It is clear that they were successful in that mission. Their union of modern electronic music with archive recordings is perfectly suited to capturing the strange juxtaposition of dated sound clips with futuristic music. It will be very interesting indeed to see how this band develop in future. Such an excellent album has shown they can escape the gravitational pull inherent in the novelty value of their first album to imaginatively launch their music into higher creative orbits.